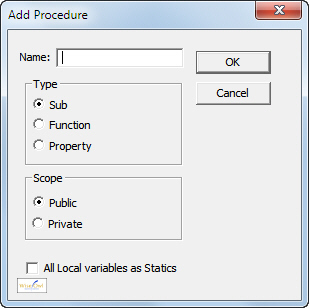 When you choose Insert --> Procedure... from the VBA code editor menu, you can insert a Sub or a Function (the word Property is discussed in a later blog on classes). To supplement the list of built-in Excel functions. This blog will show how to do each of these in turn, but first let's look at the syntax of a function. The numbered differences are explained below. A function begins with Function and ends with End Function (rather than Sub and End Sub). A function has a data type (this one is of type Long, since we don't know how big an integer we'll have to return). Within a function, you have to set the name of the function equal to something (here, the square of the number contained in the argument). VB, C# and many other programmers should note that - irritatingly - there is no RETURN statement to return the value of a function in VBA. You can call functions from Excel (shown in more detail in the final part of this blog), from another subroutine or from the Immediate window. Examples of each follow! We want to return this ... ... when you type in a number. 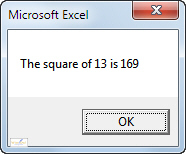 As you see, you can use Square just as if it were a built-in function in VBA. Here we've called our Square function 3 times, with a different argument each time. Again, you can treat your function as if it were one of the built-in ones in VBA. Your Square function appears ... ... and gives you the answer! The function takes a single argument, which must be an integer. Here it is the value of cell C2. One slight annoyance is that when you type the start of a function - in the case above, =Square( - Excel doesn't suggest possible arguments for it. You can get round this by using the function wizard, as shown in the final part of this blog. Now that we've seen what a function is and how to run one, let's look at how you might incorporate them into Excel.